When comparing prices on rotary tiller rentals in Campbell, Hollister and Santa Cruz, ask about sales tax and environmental fees. The Barreto model 1620B is the flagship of their Tiller line with 16 horsepower and whopping 3,500 psi hydraulic pump. 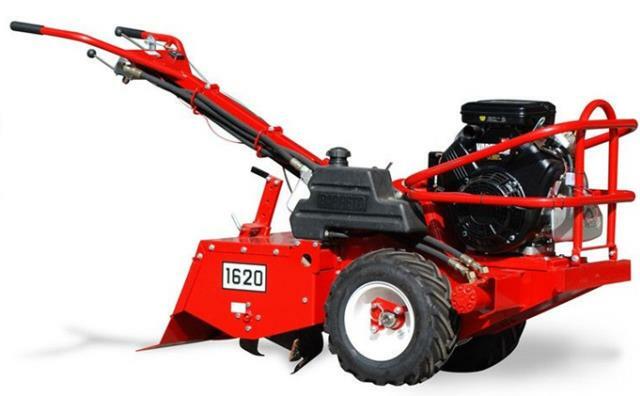 This Tiller will break up the toughest soil with ease. A safety clutch on the handlebar prevents accidental injury. * Please call us for any questions on our 16 hp rear tine hydraulic drive tiller rentals in San Jose, Campbell, Salinas, Santa Cruz, Watsonville, Morgan Hill, Hollister, Santa Clara, Gilroy, Milpitas Sunnyvale, Fremont, Salinas, the Greater Bay Area and the Monterey Peninsula.